So I have another nail art post today. I did a tape mani using a mint polish as my base, painted over it with a mattifying polish, then finished it off with a gold glitter accent. I actually had a hard time deciding whether I wanted to do a gold accent or a rainbow accent. I asked my Instagram friends & gold was the unanimous winner. I used 3 coats of Urban Outfitters Smush for the base. Next, I topped that off with NYC Matte Me Crazy. After it had dried, I put tape on my nails to mark where I wanted my accent to be. I decided to go with an asymmetrical triangle design. Then, with the tape still on, I painted two coats of Julep Oscar. 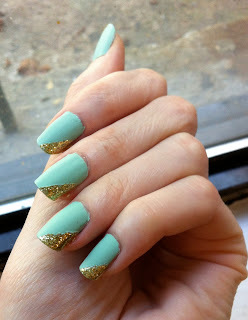 I really love the contrast between the matte mint and the glittering gold. Taping is one of my favourite nail art techniques. It is so simple yet produces great results. Though, this manicure didn't have the sharpest of lines since I was using a glitter. Below are some of my previous tape manis! I can't believe how long my nails have gotten.